A tasty combination using everyday items. Mix the beef, onion, parsley, soy sauce and seasoning together. Shape into 4 burgers. Refrigerate until you are ready to cook. Heat the barbecue. Cook for about 5 minutes on each side until no pink meat remains at the centre of the burger and the juices run clear. Serve with the Spicy Red Pepper Salsa. Whiz all the salsa ingredients in a food processor. This salsa is also great with the steaks. Grilling and frying cuts apply to barbecuing. 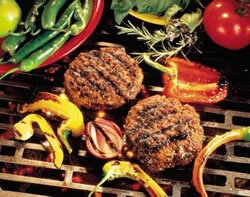 Beef Burgers are excellent barbecued, ensure that they are well cooked and the juices run clear. The time element is important in successful barbecuing - time for the barbecue to heat to maximum, the charcoal must be grey, and then time for the food to cook. Marinating and seasoning first, add to the good flavour.